Liquid herbicide for controlling submerged weeds. 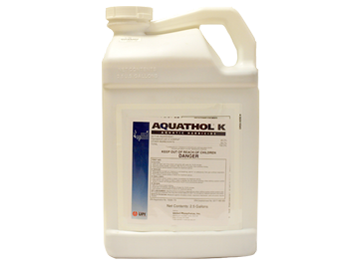 Aquathol® K is a liquid aquatic herbicide that controls a wide variety of submerged weed types. Effective in silty waters. Popular for treating Curlyleaf pondweed in cooler water temperatures. For a more complete solution, we recommend using additional dock and swim area products to to effectively control submerged weeds and algae. Mix Aquathol® K aquatic herbicide with water and spray evenly throughout treatment area when weeds are actively growing. For best results, apply during calm weather conditions. *Price includes a $30 HazMat shipping charge. It worked great last year in my Michigan pond. The instructions tho, are designed for mathematicians... not common pond owners.